SD-WAN Defined: SD-WAN stands for Software Defined Wide Area Networking. It’s a combination of Software Defined Networking (SDN), which was created for use in cloud datacenters, and Wide Area Networking (WAN) which is the network outside of your office (e.g. the Internet, or site-to-site networks like MPLS and Metro Ethernet). How do you make 15-year old router and firewall technology look appealing? Add a cloud-based web management interface and market it as SD-WAN! That’s essentially what you’re getting with this category. You buy a network appliance to connect your ISP circuits into, and instead of logging into an interface on the actual device to configure it, you now log into the vendor’s shiny new cloud-hosted management dashboard. If someone hacks their cloud-based management can they access your private data? Are you sure? Is their system and/or company PCI, HIPAA, or [insert your compliance need here] compliant? How do their security practices and implementations compare with the security offered by major brands like Palo Alto, Watchguard, Checkpoint, Cisco, and others that spend huge resources on this? If you choose one of these devices or services, be sure you feel good about the answers to those questions. Bigleaf is the leader in this category, providing optimization for access to the cloud, and for remote access to on-site resources. Public-cloud and other Internet-based applications are the most difficult to optimize connectivity for, because traditionally there is so little visibility and control to the public cloud. Unlike site-to-site VPNs, which are relatively simple to set up and monitor, connections to cloud services like VoIP and SaaS involve a lot more complexity. To optimize Internet-based applications like Cloud, you first need visibility. Bigleaf monitors each Internet connection from your office to the core of the Internet 10 times per second, across the exact same paths that all of your data travels. This end-to-end monitoring typically covers over 98% of the path from your office to your Cloud applications. You then need control. Bigleaf routes all of your traffic via our redundant Gateway Clusters in the core of the Internet. We collocate these in datacenters called “Carrier Hotels”. These locations are the major Internet peering points in each region, ensuring you have the lowest possible latency. Because we route all your traffic through these Gateway Clusters we have 100% control of the routing and QoS prioritization of your traffic. This dedicated network architecture is core to our success in optimizing Cloud-based applications. Of course you also need the best possible network security. There are many vendors that have spent hundreds of millions of dollars building advanced network security offerings, and you’re probably already using them. With Bigleaf, you can keep using your best-of-breed securitysolutions, and still get cutting-edge SD-WAN benefits for your traffic! Bigleaf drops-in between your firewall and your ISP connections, optimizing traffic while your firewall handles security and VPNs. Bigleaf creates a stable, reliable, and adaptive foundation for both cloud-based applications and site-to-site VPN traffic. 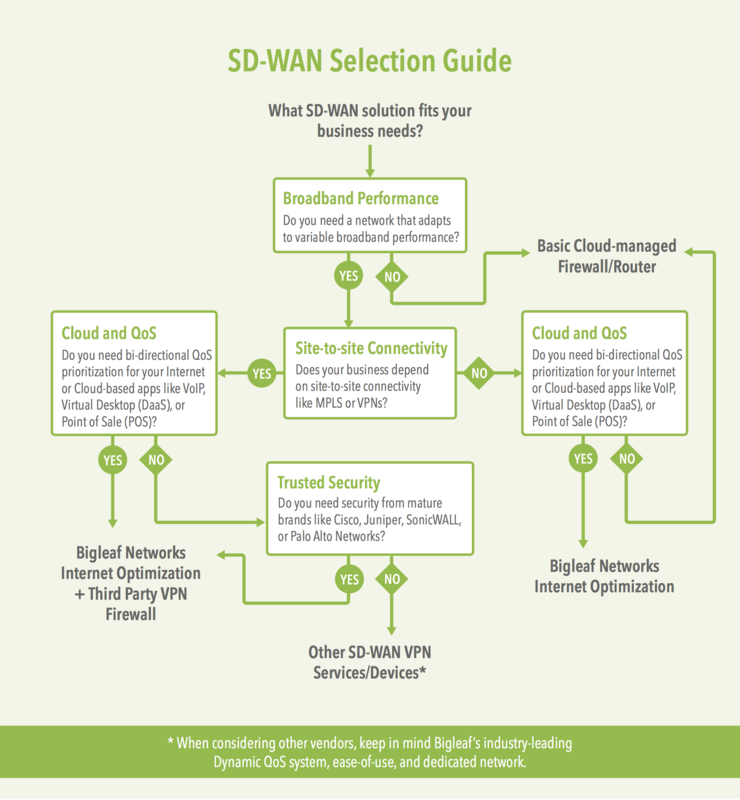 Which SD-WAN option is right for you?